Announcement Receive 10% off any order w/ coupon code YAPPYHOUR18! Please sign up for my email list to receive FREE access to my Intro to Extreme Bead Embroidery tutorial: http://eepurl.com/dhfnE .. Also, check out new low prices on all beading patterns! Orders for custom beaded dog jewelry, pin pendants & bead-embroidered pet portraits will be completed on a first come first serve basis. Thanks for looking! Receive 10% off any order w/ coupon code YAPPYHOUR18! Please sign up for my email list to receive FREE access to my Intro to Extreme Bead Embroidery tutorial: http://eepurl.com/dhfnE .. Also, check out new low prices on all beading patterns! Orders for custom beaded dog jewelry, pin pendants & bead-embroidered pet portraits will be completed on a first come first serve basis. Thanks for looking! Outstanding bead work! Outstanding customer service. Cool, my Small Business Saturday kit came today via FedEx!! I am getting ready for the busy holiday season. This year's Small Business Saturday takes place on November 24. Please Shop Small & support your community! Finished beading my first white Miniature Schnauzer pin.. This piece is available as made-to-order. Save 10% off any purchase with coupon code YAPPYHOUR18 !! Finished beading a tiny custom Pomeranian ornament (2cm x 3cm). This piece has a sterling silver bail and hangs on a fine Italian Mesh ribbon. Of course the ribbon could always be removed to wear on a necklace chain. Do you like it? Between Abstraction & Reality. Small Group Show hosted by Cambridge Art Association. Cambridge, MA. 2016. I love to create extremely dimensional beaded paintings by stitching glass seed beads to felt. My pieces are inspired by classic cars, dogs, and the places I travel. The idea for my first bead-painting came soon after I beaded a 6" x 9" panel depicting a flock of flamingos. I needed a way to display the finished piece, so I stitched the beaded panel to a canvas and painted in the extended environment. It was a simple concept, but I really liked the result, so I sent in a photo to Bead & Button Magazine. They published Flamingo Moon in 2005. That publication eventually led to my first commission, which was an experience that helped me find my artistic path..
For most pieces, I usually work from a photo or a series of sketches. Using a template, I cut out many layers of felt shapes which are then stitched together. This felt foundation helps to create the relief aspect of my work. Tiny glass beads are then stitched onto the felt 2 or 3 at a time using a needle and thread. Sometimes I layer beads on top of beads for a more dimensional effect. This process usually takes many hours. I often work late into the night and break a lot of beading needles, but the results are worth the effort! In 2006, I began documenting the progress of each piece on my blog. 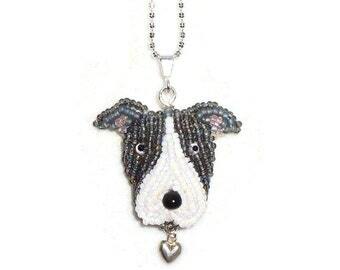 Readers started to notice the little beaded dogs in my paintings, and began requesting them as pins or pendants. They also wanted to learn how to make their own.. Suddenly, The Lone Beader's Gallery Shop was born.. While I always have plans for creating larger beaded art pieces, I stay busy making beaded dog pins and pendants for pet lovers around the world. 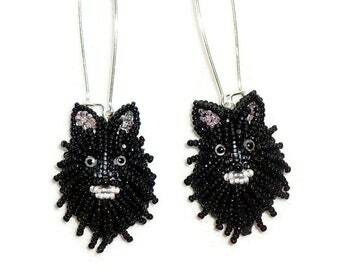 I also sell beading kits and patterns which explain how to make some of my little beaded dogs. Perhaps my next challenge will be teaching a bead embroidery class.. One bead at a time! Thank you for your interest in my beadwork! Please visit TheLoneBeader.com for more photos & news, and please stop by The Lone Beader's blog to follow the progress of her bead embroidery. Returns cannot be accepted on customized orders, personalized items, or commissioned paintings/ portraits. Returns on ready to ship items will always be accepted when requested within 7 days of receipt. Customer will be responsible for any postage fees required to ship the item back. If the order is domestic and valued at $100 or more, the customer must insure the shipment for the value of the merchandise and ship the return with a signature shipping service. Items valued at over $35 should be returned with a trackable shipping service. A 20% restocking fee will be charged upon return of the item. The returned item in question must be in new, unworn condition with all beads intact. If the returned item has been shipped back damaged or materially different than how it was originally shipped, a 50% restocking fee will be charged. Please message me to request a return, and once I have received the item in its original condition, your refund will be issued. If you have a problem with an item after this time, please message me and we will work out a solution. Your satisfaction is my ultimate goal. NO REFUNDS WHEN PAYING WITH BITCOIN, however I would be happy to work out an exchange if needed. I accept payment by credit card directly through Etsy, Paypal, USPS money orders, and Etsy gift cards only. If you pay by e-check please understand that it will take 3-5 business days for your payment to clear and until it does, I cannot ship. For custom order pet pins or jewelry, full payment is required in advance. Payment is required at the time of purchase. Please see Additional Information below.. Orders that are not paid for within 24 hours will be canceled, unless you are sending a money order..
All beaded jewelry & small paintings will be shipped via USPS. Large paintings will be shipped via FedEx. International buyers are welcome!! Shipments to Mexico must use Priority Mail shipping. For most other countries, USPS First Class International will be used to ship small pieces (under 12" x 12") overseas. For larger works, please contact the artist to arrange proper shipment. Please remember, international buyers are responsible for any and all customs fees upon delivery. Also, I cannot be held responsible for any international shipping delays. PLEASE NOTE: Items are shipped to mailing address that Etsy provides unless otherwise notified. Commissions will be accepted on a first-come first-serve basis. Great ideas for a commissioned piece include wildlife, pet portraits, hot rods, movie cars, fire trucks, airplanes, military vehicles, space ships, robots, city scenes, musical instruments, or anything else you can think of! If you are interested in a custom beaded brooch or pendant, payment for the full amount must be made in advance. Please note that items listed as made-to-order take time to create, and will ship approx. 7-10 days from purchase date. Due to the nature of this fine craft, no two pieces of beadwork will be exactly alike. Seed bead colours may vary slightly. Bead paintings are ready-to-hang. There is no need for framing, although it is recommended. To preserve your piece, keep away from direct sunlight. To clean your piece, dust with a feather-duster, or a very lightly dampened cloth only if necessary. Do not use any household cleaners, as the chemicals will break down the threads that hold the beads in place. With a little bit of care, your piece will last many years to come. What is the definition of The Lone Beader™? One who creates beadwork without the assistance of company of others and/or one who prefers solitude while creating beadwork. In my home studio in Boston, MA, USA. The art of stitching tiny glass seed beads to fabric using a needle and strong nylon thread. Do you make custom beaded pet pins or portraits based on a photo? Yes, I do! I would love to create a special keepsake dog pin or framed portrait just for you. Please message me with a photo you have in mind and I will get back to you with all the details. How long do custom orders take to create? Most beaded pins require a few days to create once a design is agreed upon. Most pins or jewelry pieces ship out within 1-2 weeks depending on how many orders I have at the moment.. Framed pet portraits may take a bit longer based on size of the beadwork and complexity of the piece.